The oil and gas MLP made some moves that, in hindsight, look pretty bad. 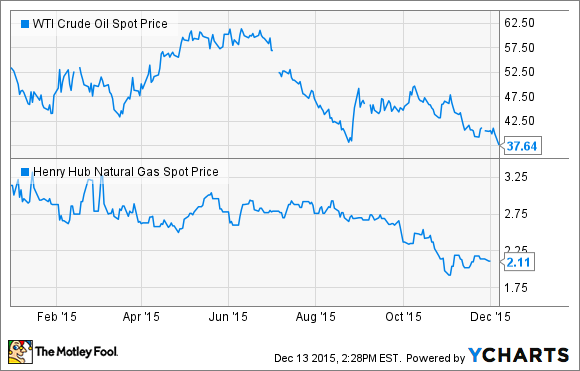 With its unit price down more than 85% this year, it's clear that LINN Energy (NASDAQOTH:LINEQ) made some bad moves. Here's a look back at some of the worst moves it made this year. Oil would average $60 a barrel. Natural gas would average $3.50 per MCF. NGLs would fetch 39% of the price of oil, or around $23.40 a barrel. Under these assumptions the company would generate more than enough cash to pay for its $730 million capex budget and $416 million in distributions to unitholders -- both of which were roughly 50% less than 2014 levels -- while leaving the company with approximately $76 million in free cash flow. This eventually forced LINN Energy to suspend its distribution to converse cash. Now, to be fair, LINN Energy was far from the only energy company that started the year a bit too bullish on oil and gas prices. Kinder Morgan (NYSE:KMI), for example, based its budget on a $70 barrel oil price and $3.80 per MCF for natural gas, which when combined with the company's strong foundation of fee-based midstream assets was expected to generate more than enough cash flow to grow its dividend by 15% while still generating $654 million in excess cash flow. However, with both commodities recently nearly 50% lower than those levels, Kinder Morgan's margin for error was much slimmer than expected. When that was combined with a market that was growing deeply concerned with its balance sheet and ability to fund its growth, Kinder Morgan ended up cutting its dividend 75% to give it some more breathing room until conditions improve. The other bad move LINN Energy made this year was addressing the wrong type of debt first. After running up a huge tab over the past five years, the company had no choice but to cut its debt level amid crashing oil prices. Through a series of buybacks and exchanges the company was able to reduce its net debt by approximately $1.8 billion so far this year. 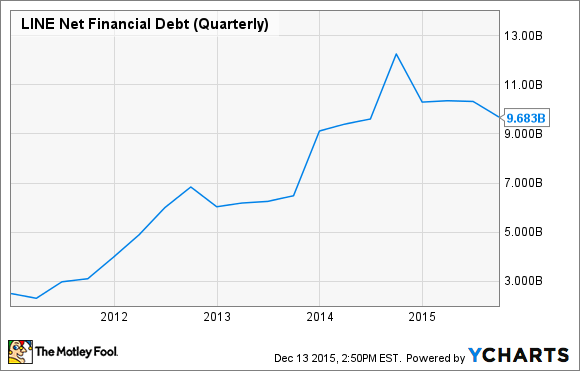 LINE Net Financial Debt (Quarterly) data by YCharts. The problem with this is that the company addressed its long-term unsecured debt first and largely ignored the most pressing type of debt, which is its bank debt. Those banks, which had lent liberally in the past, really pulled back on LINN's credit this year. In fact, the company started the year with $2.2 billion in available borrowing capacity on its bank credit facilities after its banks agreed to increase its combined borrowing base to $5.9 billion in late 2014. However, by October LINN's borrowing base shrank to just $4.5 billion, after its second borrowing base cut of the year, leaving LINN with just $790 million in available liquidity. With nearly $4 billion borrowed on its credit facility, LINN Energy is closing in on a potentially dangerous scenario where its banks could pull back its borrowing base at its next redetermination in the spring to a level below its outstanding borrowings. Such a move would force LINN Energy to scramble to find enough cash to pay down its credit facility to get its borrowing level back below its available capacity. By not addressing this earlier in the year when it had a chance, LINN Energy has put itself in a precarious position with limited options. Like a lot of its peers, LINN Energy chose to operate with a razor thin margin for error over the past few years because it was just too bullish on oil and gas prices and banked too heavily on the availability of credit. Sadly, it took just one bad year where those assumptions were way off to nearly destroy the company. Suffice it to say, the company has a lot of work to do to dig itself out of this hole.